You can fly to Europe this winter from 3 US cities and 3 Canadian cities for 25% fewer miles than regular coach award tickets with new Flying Blue Promo Awards. 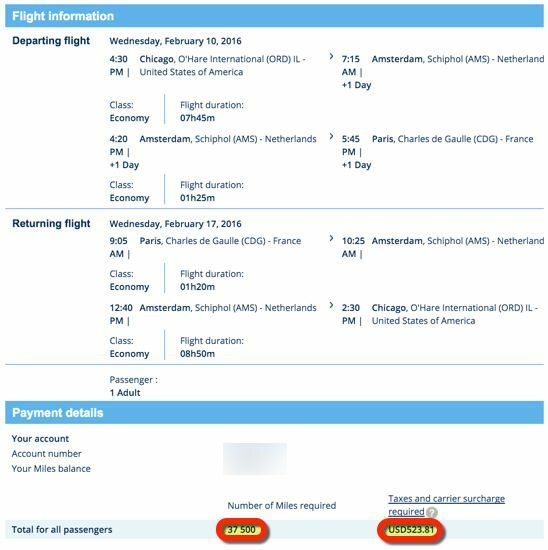 For example, you can fly 1-way from Boston to Amsterdam for 18,750 miles and ~$95, or Chicago to Paris for 18,750 miles and ~$235. The fuel surcharges might make this a not-so-good deal for some routes. But you could benefit with Flying Blue’s definition of Europe by booking a ticket to the Middle East, instead! Flying Blue is the frequent flyer program for Air France and KLM. They’re both part of the SkyTeam Alliance, but you have to use Flying Blue miles (not miles from another SkyTeam airline, like Delta or Korean Air) to book an award ticket. You can transfer American Express Membership Rewards points, Citi ThankYou points, or Starwood points to Flying Blue if you need more miles! Flying Blue Has New Promo Awards Every Month! Each month, Flying Blue offers discounted award tickets on certain routes. The current promotion includes 6 North American cities. You can fly 1-way to Europe in coach for 18,750 miles (25% off) from Boston, Chicago, or Houston in the US. Or save 25% off Business Class flights and spend 46,875 miles 1-way on KLM from Edmonton, Montreal, or Vancouver in Canada. Folks in Vancouver can also redeem their miles for Business Class flights on Air France for 31,250 miles each way (50% off). You’ll pay fees and fuel surcharges, which vary depending on the route. KLM and Air France fly to Paris and Amsterdam from the US & Canada, but you can connect to other destinations. And their definition of Europe has a few surprises! For example, Israel and Turkey are included in the sale. And if you book an award ticket, you can cancel it with no penalty within 24 hours. 18,750 miles for a 1-way ticket from North America to Europe is a great deal! There are still a lot of award seats available. But because you’ll pay fuel surcharges which vary depending on route, do the math to decide if this is a good deal for you. For example, you’ll pay 18,750 miles and ~$94 in taxes and fees 1-way from Boston to Amsterdam in coach. There are still lots of award seats available in January and February, and this can be a good deal. There Are Many Award Seats Available From Boston to Amsterdam in January and February! But keep in mind that taxes, fees, and fuel surcharges from Europe can often be expensive, too. For example, you’ll pay ~$524 in taxes and fees total for a round-trip ticket. That’s a lot of fees for an award ticket, but it’s better than paying full fare on Air France or KLM. Sometimes Flying Blue Promo awards have flights for 50% off from the US instead of 25% off. And for the current awards, you can only fly in January or February, depending on the route. So it might be worth it to wait for warmer dates and bigger discounts, unless you can find a deal that’s worth it to you! Remember that American Airlines has off-peak awards to Europe until May 15. You’ll pay 20,000 American Airlines miles each way, which is a little more than the current Flying Blue promo awards. And here are my tips for avoiding huge fuel surcharges on your American Airlines award tickets! Get a Good Deal on Award Seats Beyond Europe! The best part of this deal is that you don’t have to end your trip in Paris or Amsterdam (the hub destinations served by Air France and KLM). You can connect onward to other cities in Europe, near Asia, and the Middle East for the same number of miles! Israel Is Considered Part of Europe for Flying Blue Promo Awards. 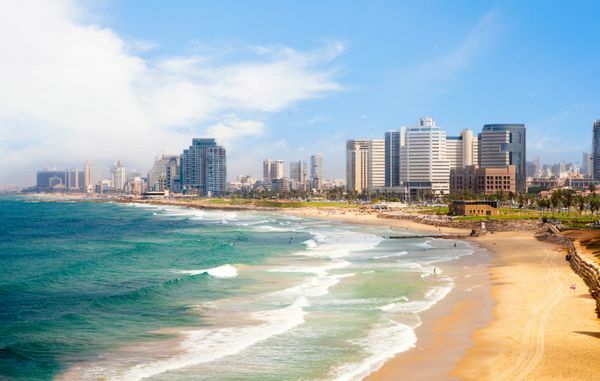 Visit Tel Aviv for 18,750 Miles + Taxes Each Way! For example, you can visit Tel Aviv 1-way for 18,750 miles and ~$104. And there are still lots of award seats left! 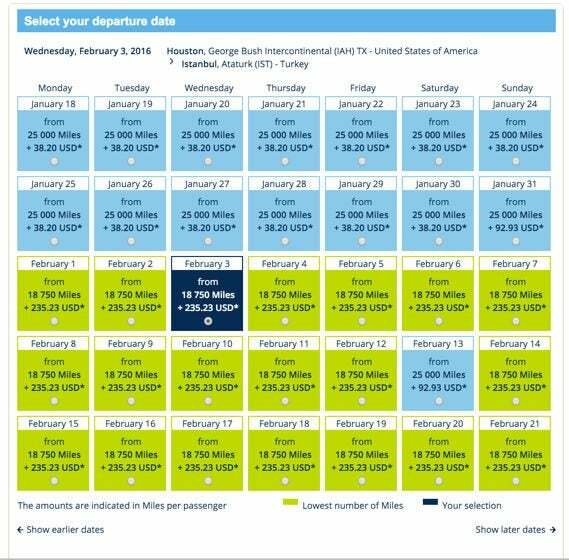 Or folks in Houston can head all the way to Istanbul for 18,750 miles and ~$235. 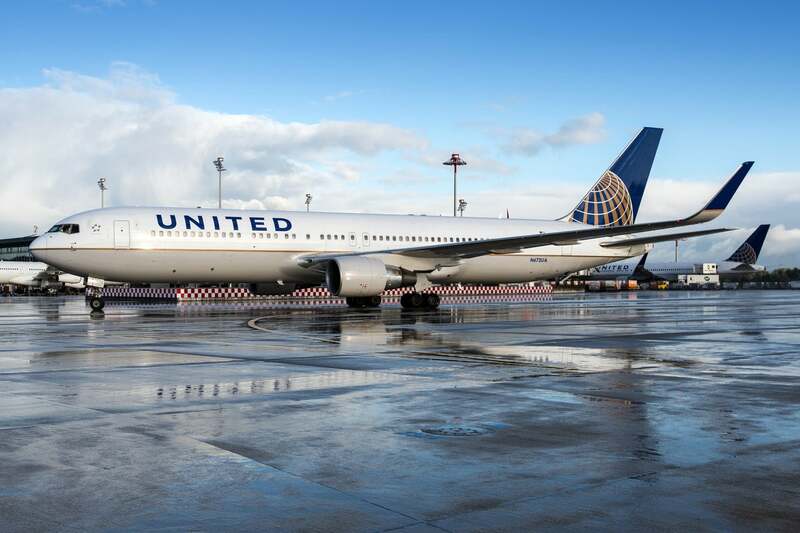 Even with fuel surcharges considered, that can still be a great deal. There are many interesting destinations! I’ll gladly pay the fuel surcharges to get all the way to the Middle East with so few miles. So this can be a fantastic deal if you plan it right! What If You’re Not in Boston, Chicago, or Houston? British Airways – If you’re a short flight away from these cities, you can save miles by using British Airways Avios points to book an award flight on American Airlines. 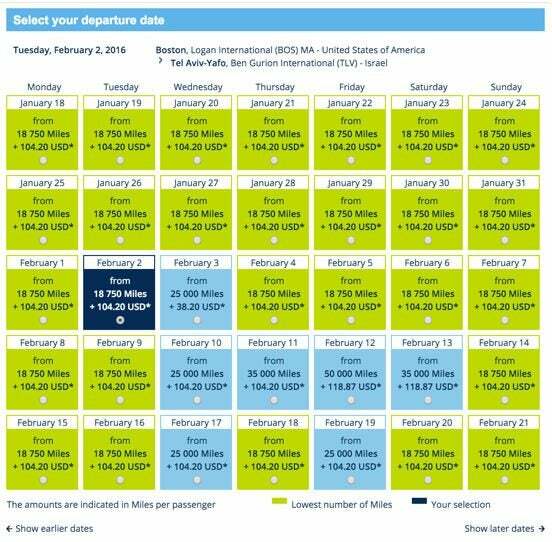 Note that British Airways is changing the price of short-haul North American flights on February 2, 2016. Or you could try to find a cheap paid ticket from your home airport to Boston, Chicago, or Houston. But as always, do the math to see if it makes sense for you. Need More Flying Blue Miles? 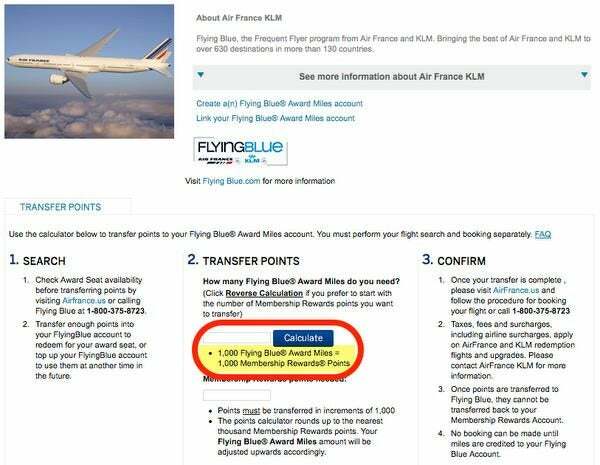 Because you can’t use miles from other SkyTeam airlines (like Delta) to book Flying Blue Promo Awards, you’ll have to book award tickets with Flying Blue miles. But they’re very easy to earn! 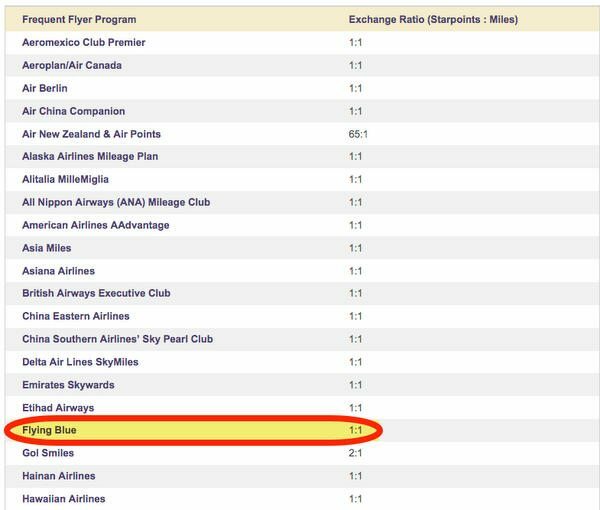 If you have an American Express card that earns AMEX Membership Rewards points, like the American Express Platinum, American Express Mercedes-Benz Platinum, American Express Premier Rewards Gold, or American Express EveryDay Preferred card, you can transfer your points to Flying Blue miles at a 1:1 ratio. And folks with the Citi Prestige, Citi ThankYou Premier, and Citi Chairman (no longer offered) cards can transfer their Citi ThankYou points directly to Flying Blue at a 1:1 ratio, too. So there are lots of ways to top off your account to redeem miles for these awards! You can also transfer points from the American Express Starwood Preferred Guest card to Flying Blue at a 1:1 ratio. And if you transfer 20,000 Starwood points, you’ll get a 5,000 mile bonus for a total of 25,000 Flying Blue miles. Note: Starwood points can take up to 4 weeks to transfer to Flying Blue. Although in my experience it’s taken from 2 to 12 days. If you plan on booking, keep in mind your exact award ticket might disappear while waiting for the points to transfer! With monthly Flying Blue Promo Awards, you can fly to Europe, Middle East, and Near Asia on Air France or KLM for only 18,750 miles each way this winter from Boston, Chicago, or Houston. But you’ll pay taxes and fees that can vary a lot. So always run the numbers before you book! You must purchase your award seat by November 30, 2015, and travel between January 1, 2016 to February 29, 2016, or February 1, 2016, to February 29, 2016, depending on the route. 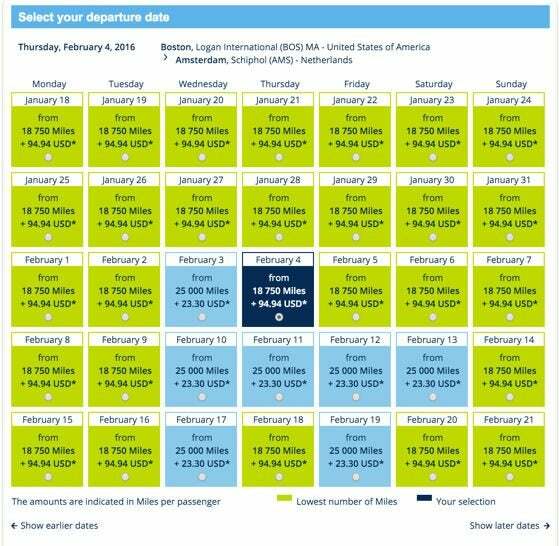 Only travel booked through Air France or KLM directly using Flying Blue miles is eligible for the deal. American Express Membership Rewards, Citi ThankYou points, and Starwood points all transfer to Flying Blue at a 1:1 ratio. 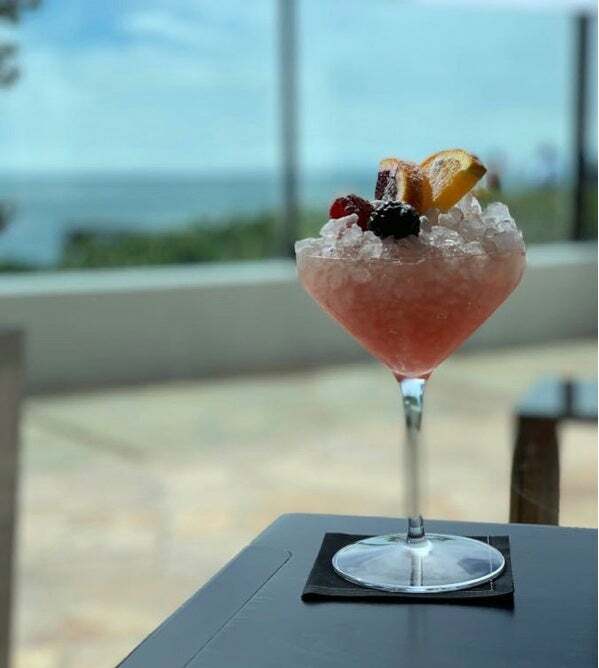 And you’ll get 5,000 bonus miles if you transfer 20,000 Starwood points, which makes the deal even better! Let me know if you plan a trip with these new awards!